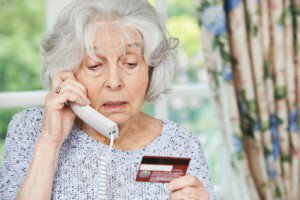 Don’t give your credit card information to strangers over the phone – there are too many scammers out there! A robocall is an automated telephone call which uses a computerized automatic phone dialer to deliver a pre-recorded message. Robocalls are used frequently by individuals running in political campaigns or by schools who need to make sure a message is delivered to a large number of families. However, at the present time, robocalls are being used for a more nefarious purpose, which is to scam the elderly. The “IRS Scam”– Someone pretending to work for the Internal Revenue Service calls a home and tells the victim they owe money to the IRS which must be paid immediately via a pre-loaded debit card or wire transfer. If the victim does not cooperate, they are threatened with arrest, deportation, and suspension of a business or driver’s license. Oppositely, the caller may tell the victim they are due a refund and ask them for their bank information for a direct deposit. This scam is particularly insidious because the scammers alter caller ID to make the call appear as if it is really coming from the IRS. “Rachel” from Cardholder Services– An automated message from “Rachel in Cardholder Services” promises to help the victim lower their credit card interest rate. When the victim is transitioned to a real life operator, the individual claims they will reduce your credit card interest rate if you pay them a fee. The Pseudo-Microsoft Tech– Someone pretending to work for Microsoft calls a victim, tells them their computer has a malicious virus, and explains they need personal information from the victim in order to login to their computer remotely and correct the issue. The Federal Trade Commission receives over 200,000 complaints per month about robocallers. Even those who have registered with the National Do Not Call Registry are not immune, as these robocallers are simply ignoring the laws. Short of no longer answering your phone, there are ways that you can protect yourself from these scams. First, consider if the automated message is personalized in any way. For example, when you receive a robocall from a doctor’s office reminding you of an appointment, your name as well as the date and time of the appointment are usually inserted to let you know the message is legitimate. If the message you are hearing is generic, hang up the phone. Next, don’t be fooled by your caller ID. As mentioned previously, scammers have ways of hiding the number they are actually calling from and displaying one you might recognize on your caller ID. They may even show the number as one that is very similar to yours in an effort to trick you into thinking it’s someone you know. Finally, when a person identifies themselves to you over the phone, stop and ask yourself if what they are saying really makes sense. For example, the IRS has been extremely vocal in letting people know that they will never call you for payment without first having mailed a bill, will never specify the exact method in which you must pay them, and do not threaten individuals with arrest. As for the “Rachel” scheme, consider that the term “cardholder services” is too generic; if you were really being called by your credit card company, they would outright state who they were. In general, your best bet is to never give out personal information over the phone.